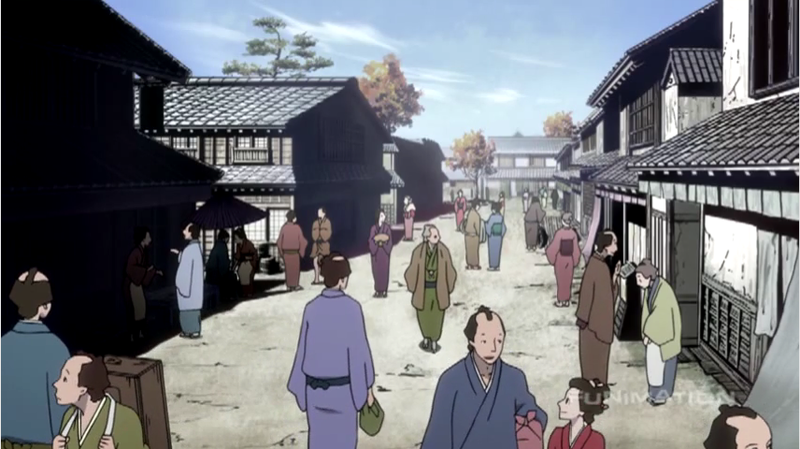 House of Five Leaves (Sarai-ya Goyou) is a new series about Edo-period Ronin, being broadcast in the Noitamina slot Spring 2010. It features animation by Manglobe (e.g. Michiko to Hatchin and Samurai Champloo) from source material by Natsume Ono (mangaka for Ristorante Paradiso). This is my most highly anticipated show of the season, and it is being simulcast at the Funimation website. As expected, House of Five Leaves is not a mindless action series. 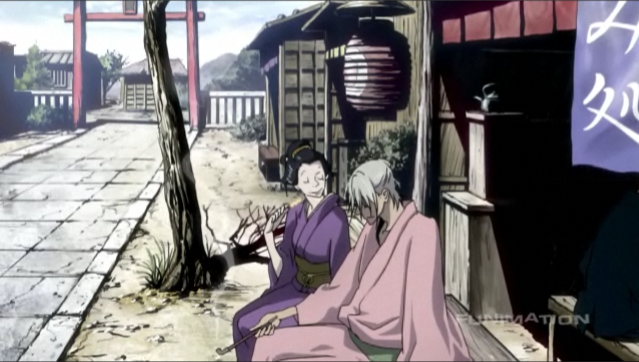 It takes time to quietly linger over moments that allow one to drink in the pace of life in Edo-period Japan, as well as observe characters without forcing judgments or plot developments. I’m expecting this to be a slower, thoughtful series, despite the potential for violence that was already depicted in this first episode. 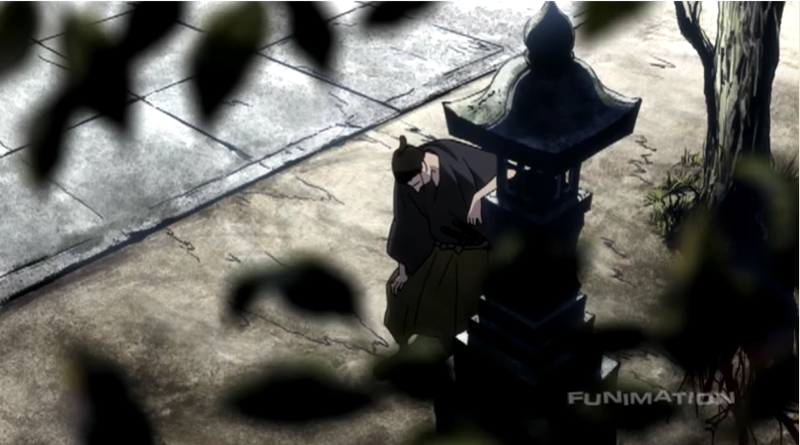 The main character, Akitsu Masanosuke (voiced by Daisuke Namikawa, Rock, from Black Lagoon, and Eigetsu Tou, from Tale of Saiunkoku) seemingly finds it hard to keep employment because he doesn’t match the preconception of a samurai; instead of blustering about, he doesn’t like drawing attention to himself. This shyness is due, no doubt to psychological issues stemming from his upbringing. The combination of his shyness and his scruples leads him to poverty. My guess is that the plot will significantly involve his character development. One day Masanosuke meets Yaichi (voiced by Takahiro Sakurai, Suzaku Kururugi in Code Geass and Neeba, in Tower of Druaga), who offers him a job as a body guard. 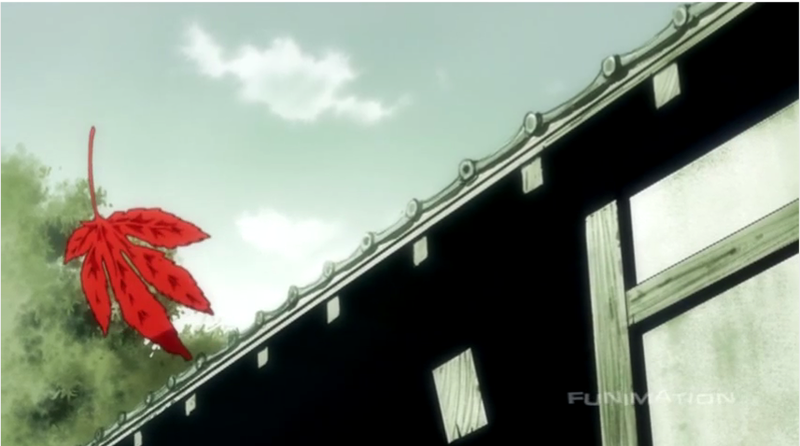 Yaichi is the leader of a gang called the House of Five Leaves. 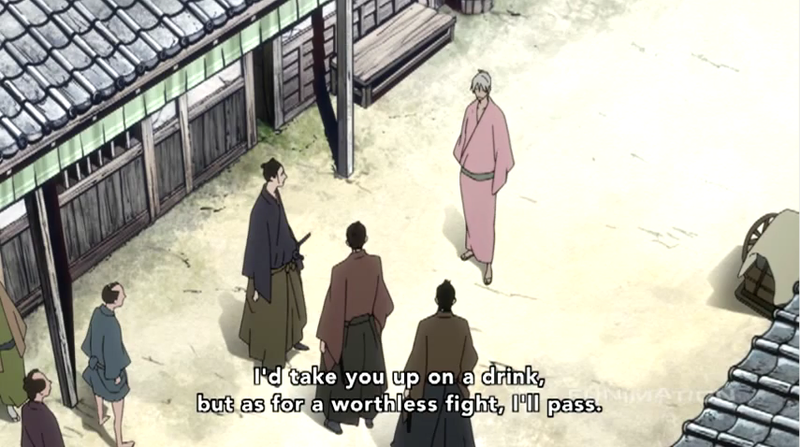 Yaichi pays well, but Masanosuke doesn’t want to become a villain, however Yaichi’s confidence and forthright way of living (not to mention the prospect of paying work) make the thought of taking the position attractive. Yaichi is already an interesting character, because he is neither without fault, nor without a trace of remorse for the wrong he does to get by in this world (as he makes clear on the bridge). One of the nice things about this series (and the Noitamina slot in general) is that it delivers older characters, and an alternative to the conventions of high school hijinx that dominates the anime world. 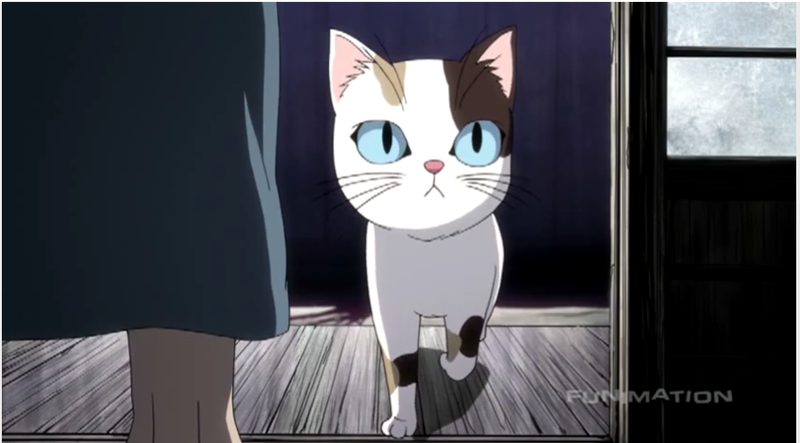 Another is the unique character design, based upon Natsume Ono’s style of long, thin bodies and huge mouths. When first watching Ristorante Paradiso, I found this style harsh and off-putting, but I came to appreciate it as a distinctive alternative to the more common styles adopted to emphasize cuteness in the younger characters that are featured in anime as a norm. Here the style gave me a sense of distance from the aesthetic customs of the present day, which helped transport me back to the Edo period. 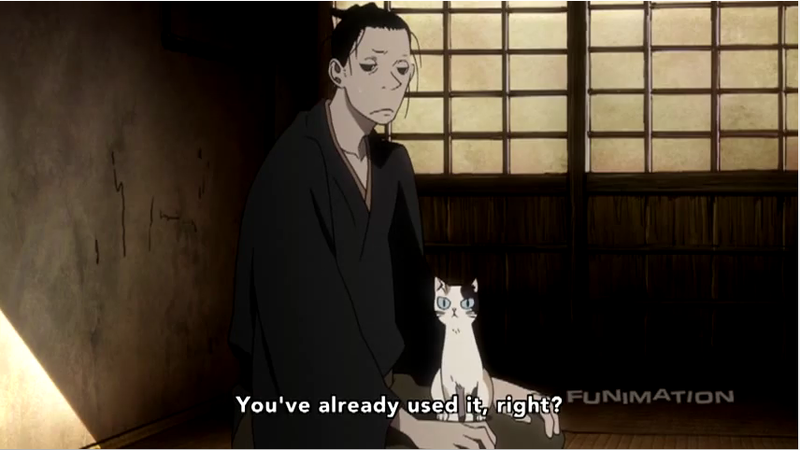 It also works well in giving Yaichi a languid look as he puffs thoughtfully on his long pipe. Yaichi smokes his pipe in front of the tea house. Neither the OP nor the ED did anything for me, although the animation in the OP was interesting, featuring lots of beautiful textures in the background, and an “endless” zoom out, that continued to bring new objects and characters into view. mmmm – I read a few sneering & unenthusiastic posts about this, and they made me think it was just my kind of show. Your own favourable post confirms it – I’m on board. 🙂 I’m sure this show won’t be universally loved. It doesn’t have the stock components for an average show. Some people, will despise it for that. Other people might really enjoy it for what it does bring. Yes older characters are welcome. What makes older characters interesting to me is that there’s already a context for failure and regret: they’re maybe 10 years removed from the 14-17 age slot wherein shonen heroes make their legends. What happened to them back when they were that age? Did they fail at something important? Did they waste their life? Did their first love end in sorrow? Backgrounds need not be overwrought and tragic, but the failure and regret allow for characters to be revealed — as opposed to be built in an escalating megaplex of unlimited potential and unstoppableness as is the norm with stock anime leads in the 12-16 age range. Agreed, and they don’t even have to be quite that old, consider Welcome to the NHK, where the characters were mostly in their early 20s; they had plenty to regret, from actions they never took in high school, to what they had failed to make of themselves since then. Another way of looking at it, when a show with young characters attempts to show that an issue is related to a long-lasting character trait, or event tied to a character’s past, they end up having to bring in memories from when they were extremely young. This tends to not work for me — it seems forced. This was the biggest problem I had with Aoi Hana, for example. I just don’t think most people have such deeply character forming events in pre or grade school. Worse: amnesia and other disorders related to child abuse or other trauma. These things aren’t necessarily bad things for characters to have in their histories to make them interesting, but externally caused problems are less interesting to me than mistakes of youth (so to speak). This sounds interesting! 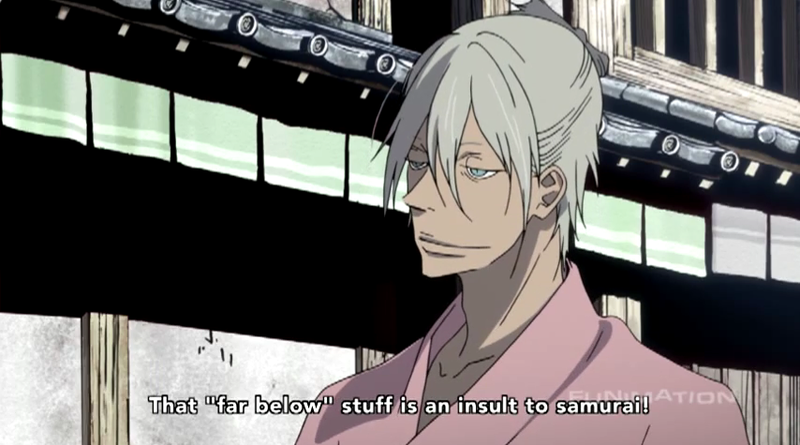 I’m such a sucker for Edo-period anime, not to mention the seiyuu involved! Yeah, Daisuke Namikawa seems to be a great match for his character. Like Rock, for example, he comes across as a bit of an ordinary white-collar worker (well, bureaucrat) whose morals make him an unlikely member of a criminal gang.